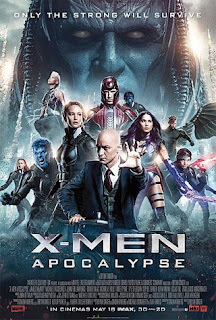 X-Men: Apocalypse is yet another 2016 comic book movie and the ninth installment of the X-Men series. In fact, it joins Deadpool as the second movie in franchise this year alone, completing a new trilogy that includes 2011s First Class and 2014s Days of Future Past. Bryan Singer returns once more to direct his fourth film in the series and the movie hosts a star studded cast featuring James McAvoy, Michael Fassbender, Jennifer Lawrence, Nicholas Hoult and Oscar Isaac amongst others. The X-Men series has certainly hit a few bumps in the road, particularly with 2006s The Last Stand and the Wolverine spinoffs. That being said, I am still a big fan of the franchise and the last couple of movies have been some of the best to date. Needless to say, I was pretty excited to see what they would do with this next chapter. Taking place ten years after the timeline altering events of Days of Future Past, the X-Men now must go up against the villainous title character in their biggest challenge yet. Apocalypse (Oscar Isaac) is the very first as well as the most powerful mutant from the entire X-Men universe. Since the ancient Egyptian days, he was seen as a god-like figure, expanding his power by acquiring the abilities of many other mutants, including invincibility and immortality. Now, he has reemerged in the world and it is up to the X-Men to save humanity from his plans of complete extinction. After reading some early critic reviews, I was slightly disappointed by some mixed to negative feedback. To be completely honest, I haven’t disagreed this much in a very long time. I really think that X-Men: Apocalypse is an outstanding comic book movie and the best installment in the now 16-year-old series. I did not find myself bored once during the lengthy runtime, as this may very well be the most action packed chapter to date. However, the film also did an amazing job of developing the plot and fleshing out the many different characters featured in the movie. Everybody in the all-star cast was on their A-game and the visual effects were better than ever. There is a lot going on in this epic, fast paced plot, but Apocalypse is truly an outstanding balance of exciting action and effective storytelling.